Let me just start out by saying, my brain works in the weirdest ways when it comes to being creative. That being said, I was trimming down a big bush (dead for the winter) in front of the kitchen window when this idea popped into my head. So, I saved the perfect branch and trimmed it down to size. 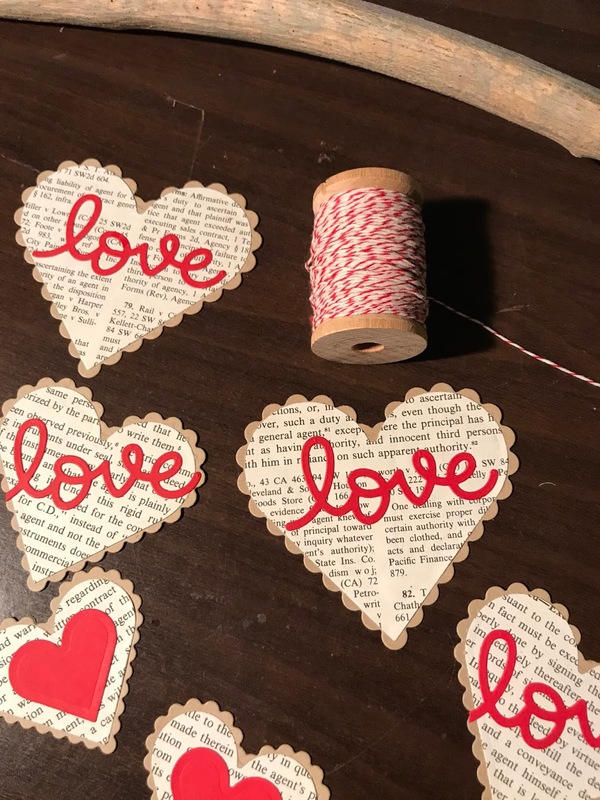 You will need a branch, some thread or string and some sweet handmade (or store bought) Valentines. 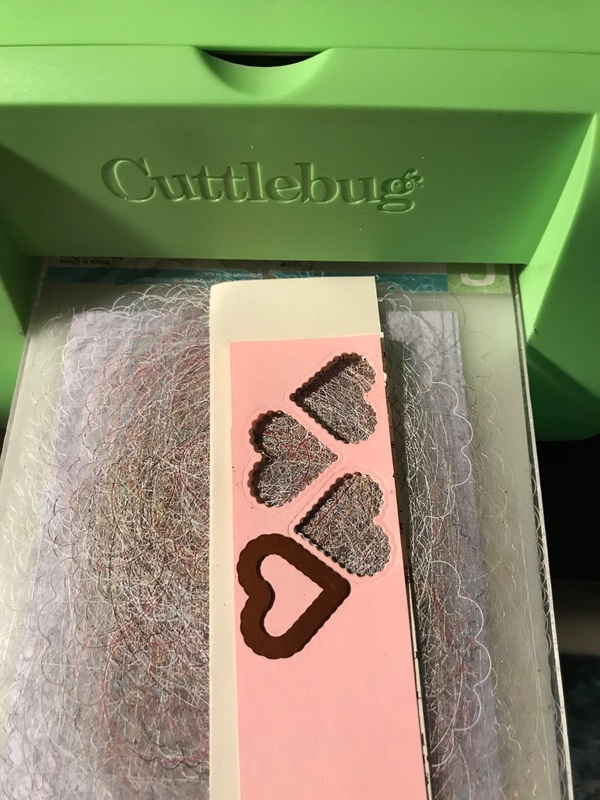 I used my Cuttlebug and my Spellbinder Nestabilitie Heart Shaped Dies as well as a Lawn Fawn "love" die to create my Valentines. I cut them all out of scrapbook papers, Kraft card stock and old book pages. Zip Dry Glue is my favorite paper crafting glue of all times, in my opinion, its the best! 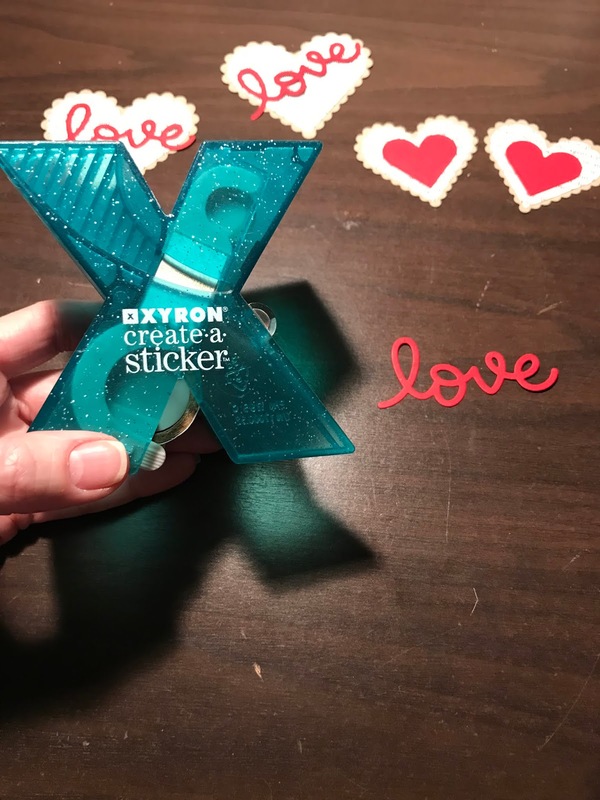 And for small items like this "love" word, I like using my Xyron Create A Sticker. And it comes out the other side a sticker! 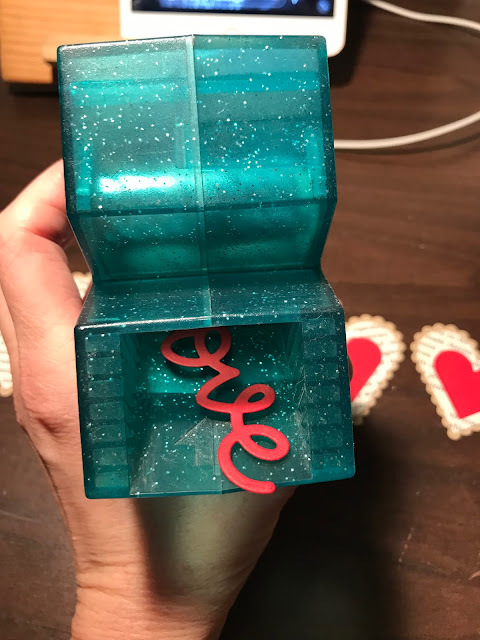 I used my embossing tool to go around all the edges. This helps the sticky part only stick to the word. Or, if you run out of sticker tape like I did, you grab the next best thing, the ZIG 2 way Glue Pen. 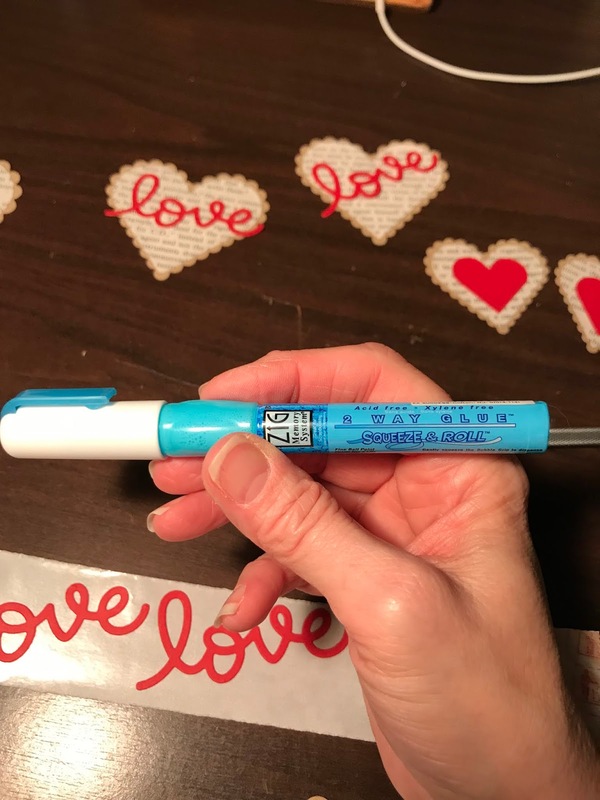 It has a fine tip and you can put glue exactly where you want it. 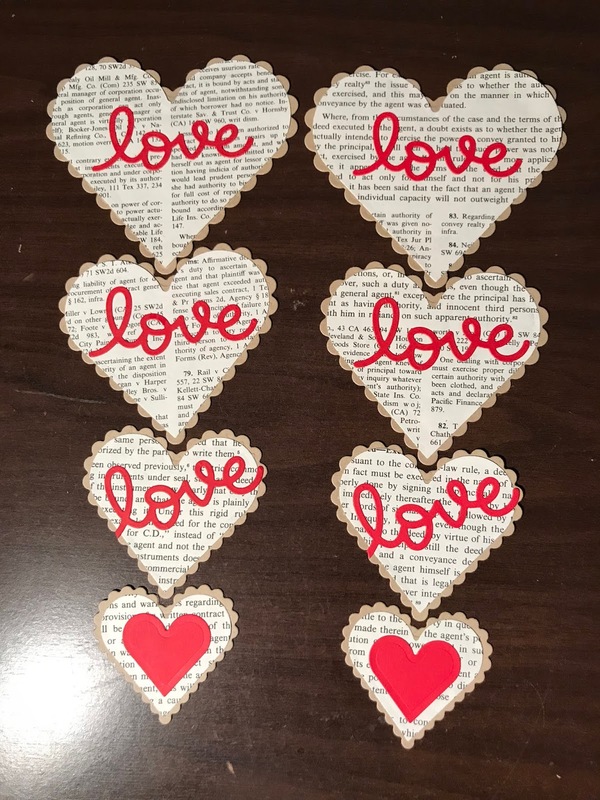 I made two of each size heart so I could glue them back to back with the hanging string in the middle. That way, if they spin while hanging, they look good all the way around. 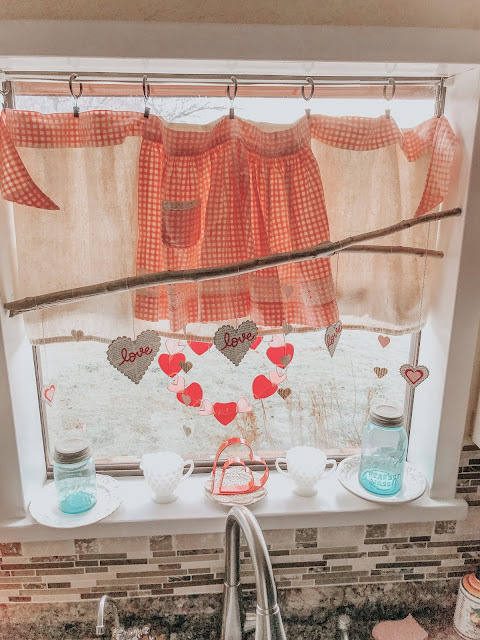 I used red and white Baker's Twine for hanging my Valentines on the branch. This was an experiment. 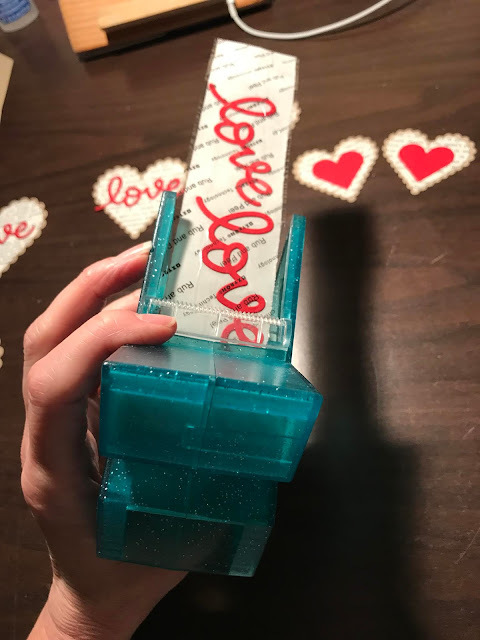 I used double sided tape on the largest heart and after hanging up for a few hours, it released and fell off the string. So, don't use the double sided tape method. I used my ZipDry glue on all the other hearts and they are still hanging strong yall! 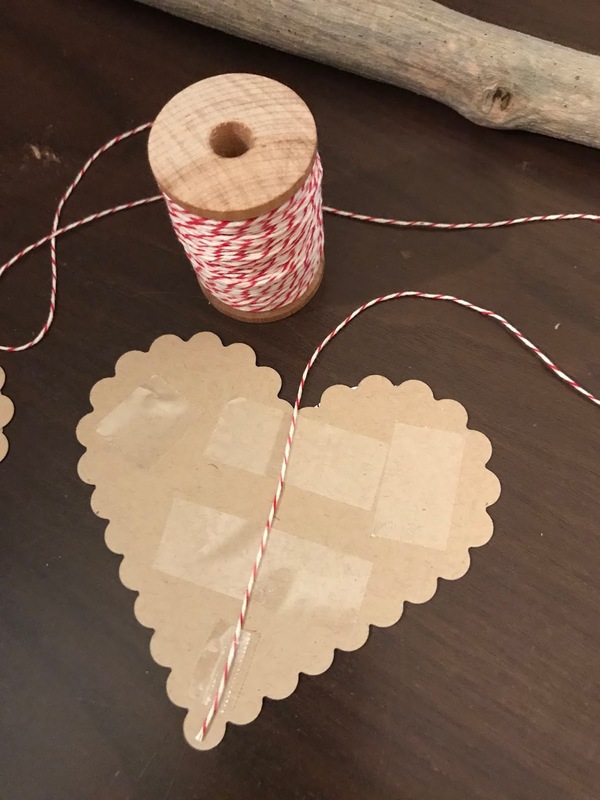 I cut my Baker's Twine at 12" each and made sure they were attached from the tip of the heart to the center top. Then I decided to add some tiny hearts for in between the big hearts so I stacked book page strips with some pink paper and cut out a million tiny hearts using my dies and the Cuttlebug again. 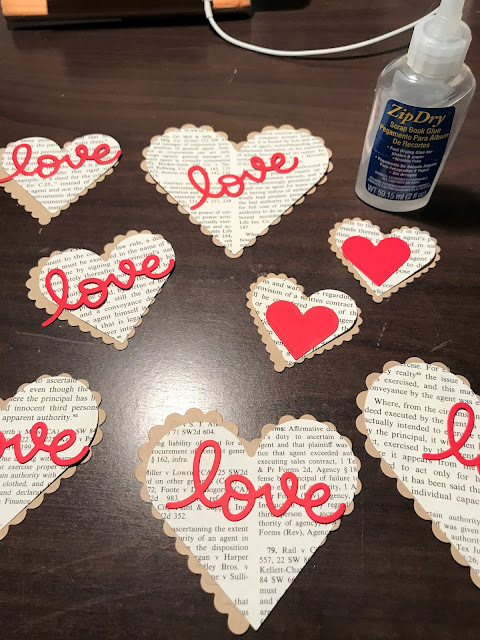 I spaced the tiny hearts out a bit and glued them to light pink sewing thread. You can barely see the thread. 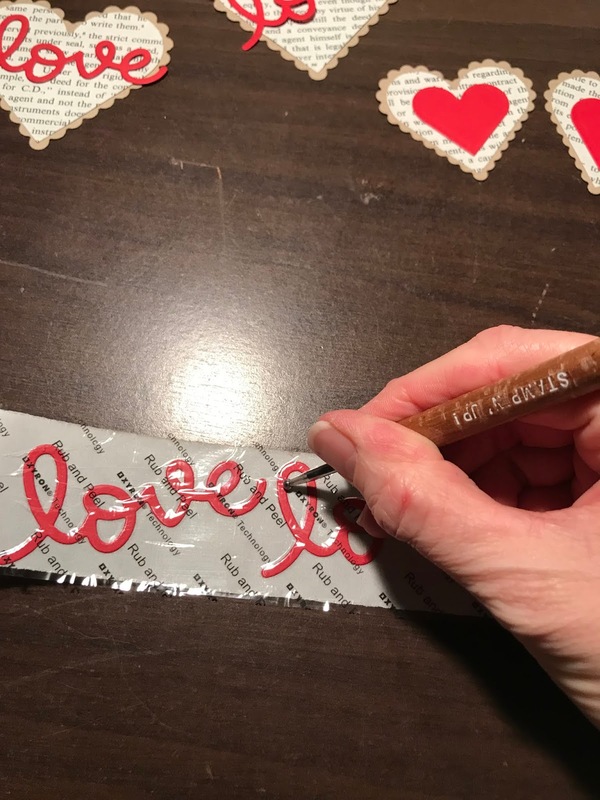 I used this same technique once before when I made my Valentine Heart Banner, click here to see it. 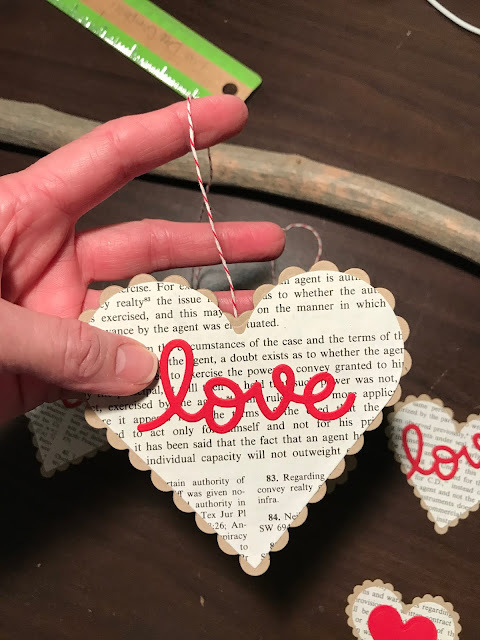 I alternated my big Valentines with the tiny heart strings and just tied them to the branch. At first I tied them loosely until I liked the placement of each one and then when I was happy with where they were, I tied them for the permanent placement. 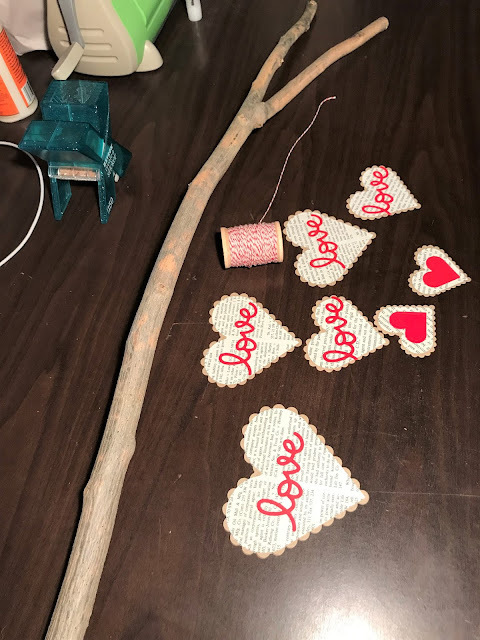 You can add a small dot of hot glue to each string on the branch if you'd like to. I did not do that step though. 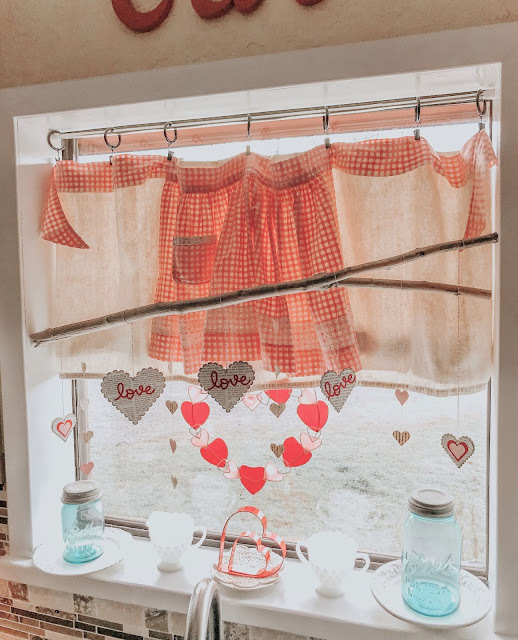 Since I have my kitchen window done up in pinks and reds, I decided to make this garland match it, that's why I added the pink accents to it. I strategically wedged the branch in the window frame, but you could also add string to each end and hang it as well. As I'm writing this blog post it has been hanging up for almost 24 hours and so far the cats have not bothered it. However, I'm thinking this may change when we go off to work and they are home alone to do as they please. Fingers crossed! 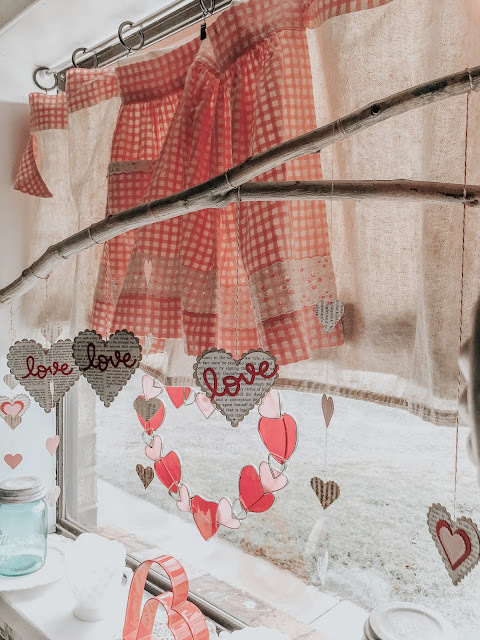 Click right here for 12 more easy Valentine projects to try. Very cute! I have an awesome branch that I'm holding onto for such a sweet purpose. Visiting from Tutorials and Tips party. 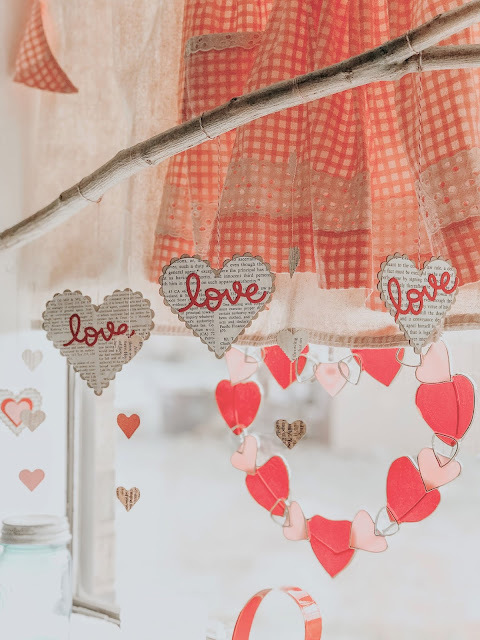 Very sweet garland, DeeDee! Thanks for linking up for the second week at Homestyle Gathering! We enjoy having you! Your garland is very cute! 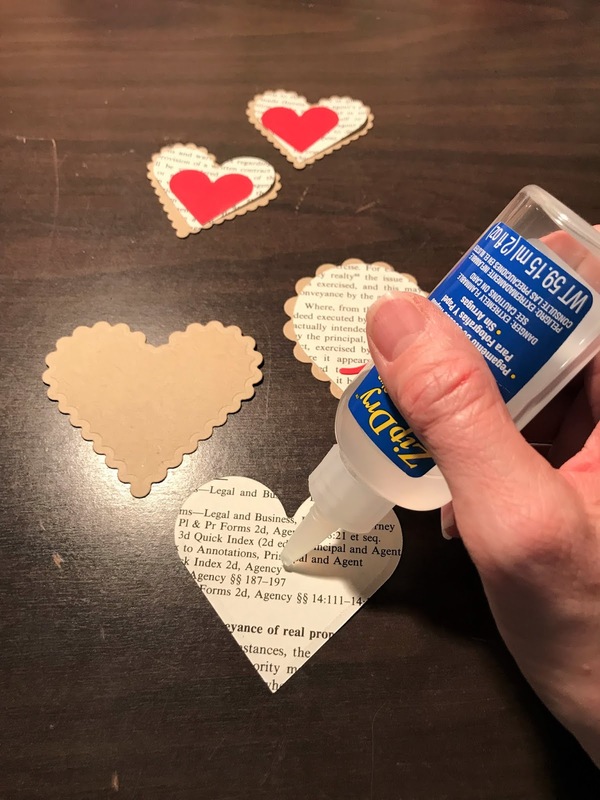 I love how you used the old book pages! 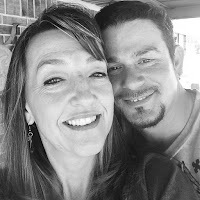 Thank you for sharing at Celebrate It!